The conservative House Freedom Caucus endorsed the Republican Party’s framework for tax reform on Wednesday. Rep. Mark Meadows, R-N.C., released a statement from the group announcing their support for the plan. Meadows told reporters on Tuesday that he’d draw a “red line” at a 20 percent corporate rate, and would oppose any bill that went higher. “This is a once-in-a-generation opportunity” to offer “historic tax relief to the American people,” President Donald Trump said during a speech in Indianapolis on Wednesday. “The tax code is now a massive source of complexity and frustration for tens of millions of Americans. In 1935, the basic 1040 form that most people file had two simple pages of instructions. Today, that basic form has one hundred pages of instructions, and it’s pretty complex stuff. The tax code is so complicated that more than 90 percent of Americans need professional help to do their own taxes. Trump knows what he is talking about, and the Government Accountability Office agrees. A September 2916 GAO report lends a backup to what President Trump has been saying. A diagram by the GAO was topped by the Internal Revenue Code, as passed by Congress. Beneath that, in widening stages, one finds “Treasury Regulations,” “Internal Revenue Bulletins,” (IRB), “Written Determinations,” and “Other IRS Publications and Information.” The IRS regards the bulletins as generally authoritative, while determinations tend to apply to individual taxpayers. 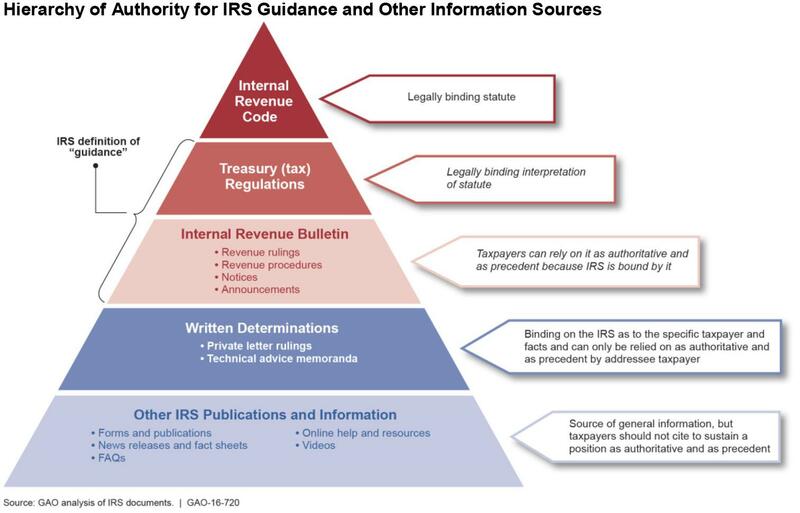 Hierarchy of IRS Guidance for taxpayers. Treasury and IRS are among the largest generators of federal agency regulations and they issue thousands of other forms of taxpayer guidance. IRS publishes tax regulations and other guidance in the weekly IRB. Each annual volume of the IRB contains about 2,000 pages of regulations and other guidance documents. The below is the PDF of President Trump’s actual tax plan. I would advise you to read it, as it is difficult to find a fair opinion on most websites. Most are just more examples of “Trump bashing,” and frankly, I do would rather go to the source. However, there are some aspects I would like to point out. When the income tax was first introduced, just one percent of Americans had to pay it. It was never intended as a tax most Americans would pay. The Trump plan eliminates the income tax for over 73 million households. 42 million households that currently file complex forms to determine they don’t owe any income taxes will now file a one page form saving them time, stress, uncertainty and an average of $110 in preparation costs. Over 31 million households get the same simplification and keep on average nearly $1,000 of their hard-earned money. For those Americans who will still pay the income tax, the tax rates will go from the current seven brackets to four simpler, fairer brackets that eliminate the marriage penalty and the AMT while providing the lowest tax rate since before World War II. With this huge reduction in rates, many of the current exemptions and deductions will become unnecessary or redundant. Those within the 10% bracket will keep all or most of their current deductions. Those within the 20% bracket will keep more than half of their current deductions. Those within the 25% bracket will keep fewer deductions. Charitable giving and mortgage interest deductions will remain unchanged for all taxpayers. Simplifying the tax code and cutting every American’s taxes will boost consumer spending, encourage savings and investment, and maximize economic growth. One aspect that is being wildly talked about is the Trump tax plan will actually hurt some Democrats. How can this be? A senior White House official seemed to indicate that a popular deduction for taxes paid to state and local governments will be eliminated. This will impact the Democratic voters hardest, according to the IRS. Could this be poetic justice?